The Arboretum North Gardens is one of the hidden gems of our 60-acre arboretum – indeed of the entire OSU campus. It provides a wonderful respite for taking a walk, picnicking, and even fishing. 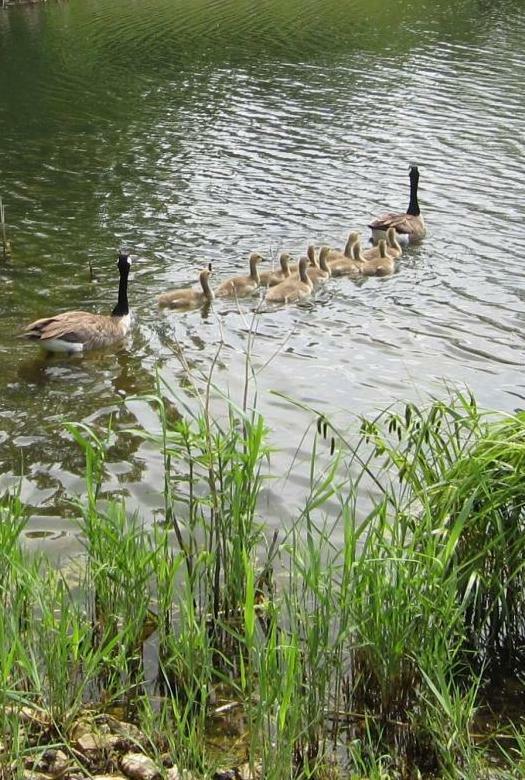 The gardens include a diverse willow collection, a 3.5-acre research lake stocked with several fish species, a picnic area, a planting of 1,000 trees native to Ohio, and more. Arboretum North is located west of Fred Taylor Drive across from the Jesse Owens Memorial Stadium. The entrance is just north of the Nationwide Ohio Farm Bureau 4-H Center at 2201 Fred Taylor Drive, Columbus, OH 43210. In the early 1980s as land in the area west of Olentangy River Road and north of Lane Avenue was being relinquished to the development pursuits of the Athletic Department, Jack Havens, president of OSU Board of Trustees and a tree promoter, along with Dean Kottman of the College of Agriculture, retained this buffer zone that would eventually include a lake, a prairie, and over 1,000 native trees. This green, buffer zone between SR315 and Fred Taylor Drive helps blend the residential and urban community with the university. Replacing a composting, waste holding site, Chadwick Arboretum was able to create a beautiful green reserve for research and enjoyment. 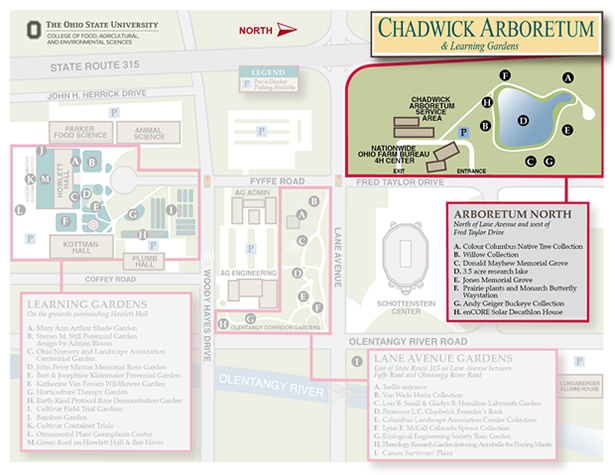 The above map shows the location of each collection/garden in Arboretum North. Click on the link below or the circled letter on the map to visit the specific garden page. Limited visitor parking for our Arboretum North location is available in the Nationwide Ohio Farm Bureau 4-H Center parking lot behind the center or in any of the Pay-n-Display parking areas shown on the map.